The highlands of Iceland are a place like no other in the world. We receive questions about the conditions on the F-roads in the highlands all the time. If you are going there or trying to decide if you should go there, it is good to know what to expect. 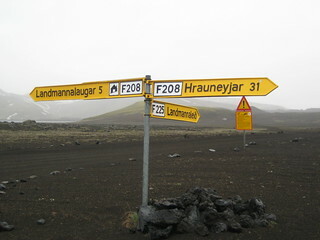 In this blog, we will show you the roads from road 1 to Landmannalaugar (F 208). Landmannalaugar are an incredible place which can not be described in words. If you are not familiar with it, just google it, choose Images and prepare to be awed. Landmannalaugar are usually open from middle of June until about middle of September but the opening time is based on road conditions and weather. It takes about 3 hours to drive from Reykjavik (without stops). So, let's hit the road. We start our journey off road 1. If driving from Reykjavik you turn left to road 30. Then you turn right on road 32 driving alongside Þjórsá river towards the highlands of Iceland. The drive up the river is beautiful and the view towards the active volcano Mt Hekla makes it even more spectacular. It seems that Google was blessed with an exceptionally nice day when photographing the route as you can see on the Google map below. There are sights in the Þjórsárdalur valley worth visiting. The beautiful Hjálparfoss waterfall and Búrfellsvirkjun power plant are close to road 32. If you have time to spare then you might consider driving up to Stöng, a reconstructed farmhouse, built like we believe our ancestors lived in the age of Settlement. We reach road 26 which marks the beginning of the highlands (and the end of Google maps). You gradually start to see vegetation turn in to black sand and rocks. However, the road continues to be a comfortable asphalt road for a while, actually all the way to F208 the road to Landmannalaugar. On the road we pass Hrauneyjar guesthouse which has a restaurant and gas station. This is a good spot to fill up before entering the highlands. 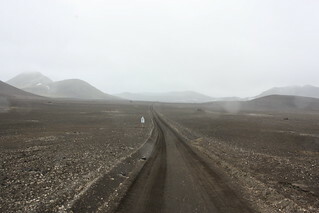 The moment has arrived, we turn on to our first gravel road, road F208 to Landmannalaugar. If you have a rental car it has to be approved to drive on highland roads from this point on. We only need to cross one river on the way and that is right before we get into Landmannalaugar. Driving to Landmannalaugar (Iceland) via the F208 from h_matt_ on Vimeo. 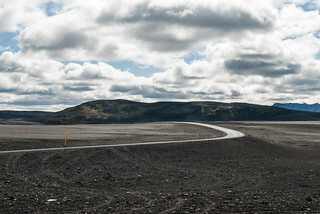 The route from the main road to Landmannalaugar in Iceland via the F208 (north route). This ends just prior to the water crossing. 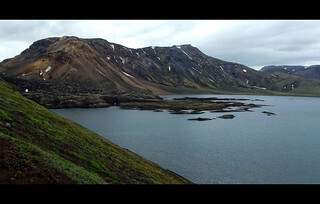 We reach Frostastaðavatn lake right before Landmannalaugar. This is a good spot to stop and take photos, if weather permits. The last hurdle before you reach Landmannalaugar is in the form of a river, the only river on the route. The water flow in the river can vary greatly depending on conditions in the highlands at the time. If you are not used to crossing rivers, please seek advice or wait for others to cross and follow their lead. 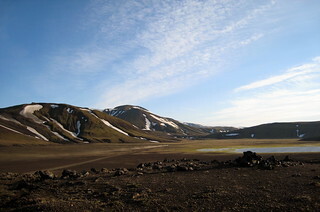 For more info on Landmannalaugar check out these info sites and photo blogs. We hope this information will help you know what to expect when you plan your trip to Landmannalaugar in the beautiful but unpredictable highlands of Iceland. Signy and the SADcars team.